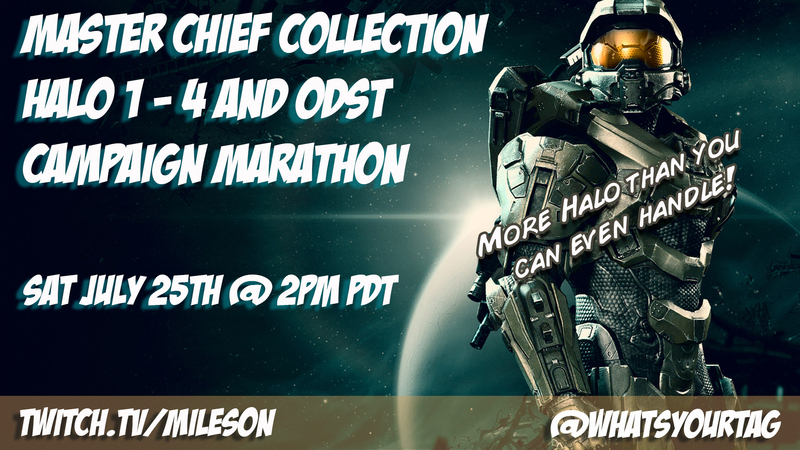 Halo: Master Chief Collection Complete Campaign Marathon – What's Your Tag? The What’s Your Tag? crew will be making Halo history in the near future when we tackle our most extreme marathon to date. On Saturday July 25th at 2pm PDT we’ll begin playing through every single Halo campaign and we won’t stop until we get the job done. That’s right, folks. We’ll be powering through the campaigns of Halo 1, Halo 2, Halo 3, Halo 3:ODST, and Halo 4 over on our Twitch channel. That’s a whole lotta Halo! Originally we planned on promoting this as a 24-hour marathon, but realistically it could take even longer than that. Our bodies are ready. If you’re a Halo fan or just feel like watching grown men physically and mentally suffer, we’d love to see some of you hanging out with us in the stream. We’ll be doing some really fun stuff with this marathon including giveaways and reviving the dreaded “Wheel of Misfortune.” If you like watching Miles eat terrible, terrible things and have suggestions for terrible foods or food combinations to add to the spinner, let us know in the comment section below! Right now we have pork brains in milk gravy, habanero peppers, and gefilte fish on the list. Anything you folks can do to help spread the word about the stream is greatly appreciated. Just simply sharing the banner on Facebook and Twitter would be huge for us. If you’re a fellow streamer and want to show us some major love, we’d be pumped to see you host our marathon when you’re not online. Thanks for all the support! We’re super excited for this challenge!